This summer, we planned our biggest, grandest RV-cation ever! It started with the idea of driving up to Montana to visit friends. We found so many great things to see and do along the way, that it then because a long RV trip with many stops, one of which was a brief stop to visit our friends. We were gone for 20 days, drove around 4,500 miles, explored 3 state parks, visited 3 national parks, saw 2 national monuments, and spent a few days in Missoula, MT with the Thompsons. We did lots of hiking and exploring, went river rafting, saw amazing sights (from canyons to mountains to caves), came across lots of wildlife, enjoyed sweet time with dear friends, and made some great family memories. All in all, it was a successful trip, which means that we can plan another cross-country RV trip in the future! Fort Richardson State Park, TX: We had a brief one-night stay here just to break up the trip. It was a good brief stay and the boys enjoyed climbing the trees and exploring the rocks. Randy and I appreciated all of the fort buildings (including a morgue, which was kind of creepy). Not sure we'll visit it again, but it was a good stop along the way. Palo Duro Canyon State Park, TX: We spent 2 nights here and were very glad that we did. It was hot (summer in Texas), but beautiful. Getting down to our campground at the bottom of the canyon was pretty scary. It was a 10% grade down the canyon road, which was super tiny with no shoulder or guardrails - not exactly comforting in a big RV. We hiked a couple of trails - our favorite was the canyon trail (up to the top of the canyon and then back down). It was a "strenuous" hike (according to the park's hiking map), but well worth-it. It was fun climbing up the rocky path and along the edge of the canyon and we were rewarded with breathtaking views. We also saw the outdoor Texas musical that is performed in the park, which was cheesy but still a good experience - and it allowed us to see the sun set, the stars come out, and there was a fireworks show at the end. We definitely want to visit Palo Duro again. Royal Gorge Suspension Bridge: We took a slight detour to see the tallest suspension bridge in the country. Unfortunately, we were under the impression that is was free to walk across, only to get there and find out that it's something like $18 for adults and $14 for kids. So we opted not to spend that kind of money (which I regret now, but oh well) and just enjoyed seeing it from where we stood. And our pit-stop there did put us at a fun little RV park for the kids, where they got to play and do a lot of neat things. Rawlins, WY: We just stopped here to sleep for the night on our way up to the Grand Tetons. Grand Tetons National Park, WY: This place was incredible!!! The Teton mountain range is beautiful! We did lots of hiking here and got to see many incredible sights. The lakes are so clear and pretty. We saw a fantastic waterfall. We saw a moose out in the trees just munching away and sat and had a snack while we watched it eat. We also had some osprey sightings, as well as pronghorn gazelle, and cute tiny chipmunks were everywhere. We absolutely want to return to Grand Tetons again one day - many times!! Yellowstone National Park, WY: It was neat to see all of the hydrothermal features and we are glad that we went and experienced them, but it's not something we'll want to revisit repeatedly. They are cool to see, but not exactly pretty. Also, we found Yellowstone to be too crowded and touristy. And it is such a large park that it takes ages to get from one area to the next so we spent entirely too much time in the car instead of out exploring nature. We did see lots of wildlife, mostly bison, but also lots of elk and mule deer, and we even had a grey wolf sighting which was neat. Missoula, MT: We went to Missoula to visit our dear, sweet, wonderful, lifelong friends. Missoula is a cute, sweet little city, but we were mostly just happy to be with our friends. We hiked "The M," ate ice cream at The Big Dipper, played at a waterpark, went to a movie, checked out the local farmer's markets, went on a river rafting trip down the Blackfoot River, did some fireworks, saw the town's fireworks, and made even more memories with the awesome Thompson family! Custer State Park, SD: We loved Custer SP! It's so pretty - rolling green hills, forests, streams, wildlife. We didn't get to explore it as much as we would have liked because we were off visiting other neat places nearby - Jewel Cave National Monument (we toured the cave, which was awesome! ), Wind Cave National Monument (so pretty! ), and Mount Rushmore (one of those amazing sights that just needs to be seen up close and in person). We did enjoy driving the awesome mountain roads in Custer (super windy with several carved-from-rock tunnels) and saw lots of wildlife (bison, burros, deer, pronghorn). We definitely want to return to Custer S.P. and spend more time hiking and exploring. We had a short but sweet stay at Fort Richardson State Park. The boys enjoyed climbing the trees, exploring the rocky areas, and visiting the old fort buildings. We loved Palo Duro Canyon State Park in Texas! It was such a unique place to visit, this 2nd largest canyon in the country. Sunsets and sunrises in the canyon were gorgeous, as were all of the canyon views as we hiked along the trail up and down the canyon. We saw a horned lizard (horney toad) which was very exciting for the boys. And we watched the Texas outdoor musical that is performed there. It was a nice 2 day stay and we hope to visit it again and explore even more of the park. We had one really bad day on our trip - the day we had repeated tire issues with the RV. It started in New Mexico when everything started vibrating because of the tires. We stopped at a tire shop in Trinidad, CO (just over the border) where they showed us how the front inside tires were extremely worn on the inside, causing the vibration. So we sat around there for 2 hours while they put on 2 new front tires and said the others looked fine. A mere 30 miles from town, as we were driving down the interstate, there was a loud burst as one of the rear tires blew out (it was very loud and very scary). We had to wait on the shoulder of the interstate for an hour and a half for someone to come and put the spare tire on. Then we drove another hour to the next decent sized town and waited in another tire shop for 3 hours (!!!) to get 2 new rear tires put on and the spare tire returned to its location. It was a scary, frustrating, exhausting day. Thankfully we remained safe and the rest and didn't have any other mechanical issues for the rest of the trip. The Grand Tetons were spectacular! It was definitely the most beautiful place that we visited on our journey. Snow-capped mountain views, crystal clear lakes, beautiful tall trees, waterfalls, wildlife. These pictures don't even come close to capturing the true beauty of the place. The boys with the Tetons in the background. Enjoying the view while we break for a snack on one of the trails. Taking in the surroundings at Jenny Lake. The trails were fantastic! Lots of rock stairs, beautiful trees, lake and mountain views. Pretty section of the trail that went by the lake (you can see Dawson's orange jacket up ahead as he hiked around it). Hidden Falls. We hiked 3 miles to get to it and then 3 miles back and it was so worth it. Family picture at Hidden Falls. There were also lots of boulders to climb on. This one provided a spectacular view of the lake. Hanging out in the Colter Bay Village area where we camped. Thankful that Dawson took a picture of Randy and I in the beautiful Tetons. Another beautiful trail, this one around a lily-pad filled lake. The boys at the overlook where Rockefeller Jr. had a picnic and was so amazed by the scenery that he dedicated years (and lots of money) to make sure that the area was protected so that others could come and enjoy it for years to come. So thankful that he did. Yellowstone was an interesting place with all of it's thermal features - geysers, steam vents, boiling water, hot springs, mud pots. We also saw lots of wildlife there - bison, elk, pronghorn, and a wolf. We saw a few of the pretty spots and would definitely wan to explore more of those next time, as much of our sightseeing on this trip was to the thermal areas (they're neat to see, but not exactly beautiful). Brady and Dawson in front of Old Faithful, which just happened to be erupting the moment we arrived. This one was really pretty - a bright blue - but scalding hot. And some more boiling water. Taking in the nearby and distant geysers. Brothers on the boardwalk trail. The guys with Old Faithful in the background. This little geyser was fun to watch too - it went off for a long time with varying small and large bursts of water. This was a cool geyser too with it's bizarre shape. Steamy hot, bacteria filled water. Watching Old Faithful erupt from the balcony of Old Faithful (which I highly recommend - it was a great view with no crowds). We saw this wolf while driving through Yellowstone - it was across the river and was pulling on and eating some large carcass. Surprise - more hydrothermal features! It's hard to tell but Dawson's standing in front of a boiling mud pot - this clay-like mud was spurting up everywhere, even onto the boardwalk that we were walking on. A bison just hanging out by one of the boardwalk trails. The boys at mud volcano. Dragon's mouth mud pit - it looked like the dragon was spouting smoke from it's mouth. Another bison along a trail. Me and the boys and the bison. Randy on one of the trails - a bison is lying by the steaming lake in the background. Closer up picture of the bison. These steamy water holes were sooooo stinky! 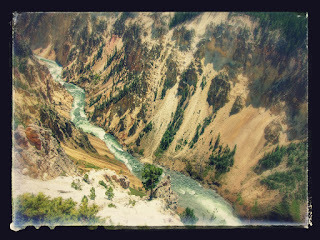 Looking down on the canyon of Yellowstone. Yellowstone River running through the canyon. Pretty waterfall with a rainbow. Dawson hanging out by the Lower Falls. Randy and I at the Lower Falls lookout. Handsome Dawson at Yellowstone River. I tried to capture the steep ascent after hiking down to the waterfall, but couldn't quite get it. It was super steep - but super fun! Elk in the field. We saw lots of elk at Yellowstone. Stuck in a bison traffic jam. This big fella finally moved out of our way. More elk - we saw this one while walking on a trail. Hiking up the mountain to get a view of Yellowstone Lake in the distance. The boys found a great place to sit at the top of the mountain. Last picture of the boys at Yellowstone.